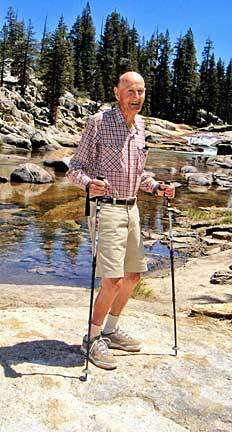 Kirk Smith in his late 80s near Tuolumne Meadows. Contributed family photo. Longtime hike leader and former Santa Cruz Group Executive Committee member Kirk Smith passed away on March 1 at the age of 92. Alan Kirkham Smith was born on September 14, 1916 in Portland, Oregon and grew up in San Rafael and Marin County. After retiring in 1973 and then serving in the Peace Corps in Ghana, Kirk and his wife Pat moved to Santa Cruz in 1975 where he became active in the local Sierra Club. Kirk served as Vice Chair of the Group Executive Committee in 1976 and 1977 and was Group Chair from 1978-1980. Later he was Chair of the Group State Parks Committee and served on the Group Nominating Committee. His affability and good nature served him well and earned him many friends. Throughout his life, Kirk had a deep connection to the Sierra. As a child he spent summers at Lake Tahoe. Family vacations included backpacking and hiking with Pat and his three daughters. “I knew Kirk through the outings he led for the Ventana Chapter. We first met in the 1990s on his annual Long Ridge hike near Saratoga Gap. After I returned for a couple of years, he asked me to co-lead it thereafter because he wanted to be sure it remained in the Ventana inventory after he retired from leading. Kirk always liked telling the story of two of his participants who met one year on the hike and returned the following year to announce their marriage. “He had a longstanding friendship with Bud McCrary of Big Creek Lumber. Because of that relationship, Bud allowed Ventana members to go on an annual hike led by Bud and Kirk on the Big Creek and adjacent Lockheed properties. We not only experienced the forest, multiple creek crossings and double waterfalls at the confluence of Boyer and Big Creeks, but also learned of the family history of the four generations of McCrarys who have made that Swanton property their home. Those who were able to participate will always remember what a unique and special event it was.